Simply the best TV I have ever owned. would not sell or trade it in for the newer cheaper made flat screens for all the tea in china! Excellent Picture quality. 16:9 Enhanced mode for widescreen. Presets for different types of video sources. Very Heavy. Sound quality is rather poor. I've had this set for a little more than 3 years and so far I have been quite pleased with its overall quality. The picture, so long as you have a high quality video feed, is excellent. Standard network television could be better, but the set truly shines when you are watching a DVD using the Component Video input or playing a video game through the S-Video input. Also, there are a total of 4 A/V inputs. The only place this set is lacking is in the sound quality. Like most Sony products the speakers are terrible. But, like with most TVs, it is best to use a receiver with nice speakers for sound. Another negative aspect is the weight. This set weighs around 185 pounds. Besides the fact that this TV is very heavy I can't find any weaknesses. This Sony Vega 32" is an awesome television. I have only had it for one week and have enjoyed it so far. Sound quality is better than I thought due to the speakers built into the sides as well as the front. This gives a great surround sound effect when you are watching TV in STEREO. The picture-in-picture feature is superb and very clear. For just over $1000.00 you can pick yourself up one of these, but you better plan on having some help because it a EXTREMELY heavy. At almost 200 pounds this TV can be quite difficult to handle. I was hoping for a better picture quality out of my cable television but I am not yet convinced it is the TV's fault. The clarity of a DVD is superb. You can even watch TV and a DVD at the same time with the picture-in-picture feature.......COOL! I purchased a 20" Sony Trinitron in 1992 and was ready for an upgrade. This TV was bought at Sears for $1,122.00 including tax. I found this price at My Digital Universe and brought it to Sears where they matched the price. Do not pay more than $1,100 for this tv (before taxes). Before taxes it's $1059.00. For the price you really can't go wrong with a VEGA! What are you waiting for, Go out and buy yourself one today! Beautiful and crisp picture. Excellent sound for those without a receiver/speaker system. Useful remote. Could use some learning remote style functions for easily switching menu settings. Weight. I'll start with the unit itself. First, it weighs a good 175 to 200 lbs, making it a hell of a pain to move around too much, but once it's in place, at least you know that it sure isn't going anywhere. The case is an attractive brushed silver color and it grows on you after a while. I thought the remote was quite intuitive and worked perfectly with my old Panasonic VCR without too much trouble although my wife had a hard time with it initially. AV connections abound and I didn't have any difficulty hooking up my VCR, DVD player, cable, and Nintendo 64 simultaneously. The picture. Well, to start with, the picture is stunning with vibrant colors and deep blacks. Normal cable TV looks 100x better than before, with a clarity and crispness that is astonishing. The four automatically set picture modes are a nice touch, although really only 2 or so are useful. The PIP function, while I haven't used it too extensively, is easy to use and clear, and as to be expected, glare is non-existant except for light sources directly in front of the unit. Going with other sources, DVD movies look absolutely outstanding, and the 16:9 enhanced mode on the TV just makes them look even better. Even games on my N64 are a joy with enhanced clarity and sound. And speaking of sound, that's definitely one place where this unit shines. I don't currently own a Receiver or speaker system so I'm using the set's speakers for everything and they really sound great. The simulated surround and SRS modes really seem to work and the sound output is clear. One small complaint with the sound is that occasionally voices on DVD's seem muted, but this might be because I have something set incorrectly and not due to a problem with the set. In addition to movies, I listen to music CD's through the set's speakers and even they sound pretty damn good to my untrained ears. Overall, I'm extremely pleased with the television. I found everything easy to set up and use and pretty intuitive. Both picture and sound are superb and it has more than enough inputs to keep you happy. If you're in the market for a good set, I can't do any better than to recommend this unit or one of its brothers. I had a "loaner" KV-32FV16 for a week, until I received my new KV-32FV27 from a locally-owned dealer. The 32FV16 was their in-store display model. The 32FV16 had some pretty annoying geometric linearity problems -- mostly, the top third of the screen was "leaning to the right." This was =incredibly= noticeable when I played a certain PlayStation 2 game with a white background: the picture actually spilled over to the right of where it would normally be "framed" on the screen, and it pulled completely away from the left corner of the screen. The 32FV16 also had the quite common color impurity blotches that many Wega owners have mentioned. These are usually "pinkish" areas found in vertical bands on each side of the screen. This set had them pretty bad -- the 32FV27 I wound up with had this problem to a much, much lesser degree than the 32FV16 did. Otherwise, the 32FV16 had all of the good qualities that attract folks like us to the Wegas -- exceptional picture, totally flat screen, and plenty of features. And, to be fair, the 32FV16 wasn't really any worse than the competition to any degree -- it is incredibly hard to find any other large-screen set that doesn't have color impurities and problems with geometric linearity to a significant degree. I compared the Wegas to the Panasonic CT-32HX40 and to a digital Samsung 32-inch "Dynaflat" set. I tried very hard to like the Panasonic HX40, but I found it incredibly unacceptable in many ways. I saw two examples on display locally, and both exhibited a VERY STRONG green emphasis -- you couldn't get a "neutral grey" on them, because they "pushed green" very heavily. I also couldn't adjust them to any degree away from a picture I considered "too dark" and "too saturated." Plus, both samples I saw showed color impurities and linearity problems as bad or worse than the Wega 32FV16. The Samsung was OK, but it didn't have a truly "flat" screen, and it had a very limited feature set compared to the Sony and Panasonic sets. I really didn't consider it seriously. So, back to a discussion of the Sony KV-32FV16. Its feature set is unbeatable -- "anamorphic squeeze" to get the most out of "widescreen" DVD's, and its four picture adjustment presets that you can set to your tastes are things I appreciated the most. Other sets aren't even TRYING to do these things. I liked the four different presets, since while I do indeed "calibrate" my TV's to the Video Essentials and Avia DVD's, it's fun and interesting every now and then to bounce out to a more "vivid" picture like most TV sets ship with. With four presets, I could set up four different picture settings to fit my moods and the program material I watched. I must disagree with any statements that the 32FV16 wasn't good for "analog" sources such as cable and VCR inputs -- I found the picture to be MUCH better than other sets I have used with those sources. I thought the comb filter in the 32FV16 really made a picture I could appreciate out of those sources. Probably the weakest part of the 32FV16 I found was the sound quality -- I really thought it sounded like "cheap little speakers in a flimsy plastic box." If you want great sound, check out a top Samsung set -- the 27-inch Samsung "CompacTheatre" set I replaced with the Wega sets just beat the pants off of the Wegas -- it sounded like a fine, small component system, compared to the "tinny TV sound" from the Wegas. I understand that the bigger, newer Samsungs are just that much better than my old 27-inch set. I'm giving the KV-32FV16 a top score, because it truly is delivering qualities that others aren't even TRYING to do in the consumer market. Sure, it had problems, but I really didn't find anything else that didn't have the same kinds of problems, to an equal or worse degree. Best of all, the KV-32FV27 I eventually wound up with has very minimal color impurities, and it has easily the best geometrical linearity I have ever seen on a screen 27 inches or larger. I'll definitely put up a review of that as soon as AudioReview.com adds a section for it! Stunning picture on Anamorphic DVD's. Black Bar on side of screen is annoying. After having this set for almost 30 days I have opted to return it. The uneven brightness on the screen has become too annoying and the fact that Sony refuses to fix the problem, but has acknowledged it exists, is frustrating to say the least. I am now in the process of looking for a new TV. I've heard that the new Panasonic Flatscreen have had some problems as well(HX40), hopefully the latest release will have corrected the problems(HX41). I'd also think about purchasing a RCA32M110 if it performed the 16:9 "squeeze", but of course it doesn't. WHY CAN'T SOMEBODY DO IT RIGHT??! Overall though, I'd still say the picture on the Wega is damn fine and, in certain conditions, much better than most analog sets. Exceptional overall picture and 16:9 mode greatly enhances anamorphic DVDs. Too heavy. Left 20% of screen is darker than the rest. Slight bending of horizontal lines in the upper left hand corner when viewing anything in widescreen mode. I purchased this TV mainly because of its flat screen (actually slightly concave because a perfectly flat screen is not possible)and the exceptional picture. I got it at Sears with a price match off the Internet. 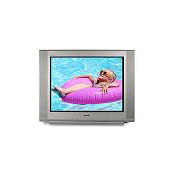 The TV was a December 2000 model. I noticed that the left 20% of the screen was darker than the rest and that there was a slight bending of the horizontal lines when watching anything in widescreen mode (DVD or TV channels with widescreen versions of movies). The Sony qualified tech came and replaced a circiut in an attempt to fix the horizontal line problem, but it didn't work. The tech also tried to fix the left 20% darker screen problem by changing settings in the service menu. That didn't work either. The tech then called Sony direct and they said they would research the problem and get back to him. Two days later Sony calls the tech and admits that this darkeness problem is on most if not all of the 32" and larger Vegas. Sony cannot fix this problem on current Vegas, and they told the tech they have no intentions of fixing this problem in future models. I returned the TV and will be looking at getting a Panasonic TAU Pureflat 32", either model CT-32HX40 or the CT-32HX41 later this year. They are more expensive because they are HDTV ready, but they are $200 cheaper than the Sony XBRs. The Vega is a great TV, but for that much money it shouldn't have any "unfixable" problems. Sony definitely needs better customer service. Using all Monster cable connects. I only give the Vega 3 stars for value because of the problems and its large price. I sill give it 4 stars overall because it does have a great picture and other extras. If the above problems don't bother you, then buy a Vega. Otherwise, consider a Panasonic Pureflat, the only other truly flat screen TV. greatfor DVDs or Laser Disk players. Good for Digital TV. Bad for regualr Cable or TV Attenas. Also very bad for regualr VCRs. Think hard before you buy this TV. Also study your needs and what additional add on you can afford. This TV is not good with VCRs and regualr cable. It's great for DVDS or Laser Disk players. However it sill gives you a good picture with regular cable. To little for to much money I say! Anamorphic DVD's are incredible when using 16:9 "squeeze". Front AV inputs, with S-Video. Digital Cable picture is great with good source. Have to pay an additional $100 or so for Auto 16:9. This is a great TV. I had been saving for awhile so that I could get a new HDTV-ready TV, but I have heard so much recently about the new DVI standard HDTV interface that I couldn't bring myself to fork over the money. IMHO, I purchased the best analog set that there is right now. The picture is really, really nice! Especially on anamorphic DVD's. When in 16:9 mode the picture quality is exceptional and very "film-like". On Cable TV, the picture is also great, especially on the digital premium channels. However, I did notice that one side of the TV is brighter than the other, but this is only noticeable on an all black picture. (If anybody knows how to correct this, please email me.) With that said, I still highly recommend this TV to anyone interested in a higher-end analog set. As a side note I was able to have my local Circuit City pricematch COSTCO... sort of. They agreed to match the price if I signed up for the extended warranty, which I did, at $150. I was also able to get a one year no-interest financing deal. Needless to say, I am very happy with the price that I paid and the overall quality of this TV. Old Sony Trinitron, RCA 19-inch, 36-inch Mistubishi.